In what 3 ways is heat transfered to the atmosphere? 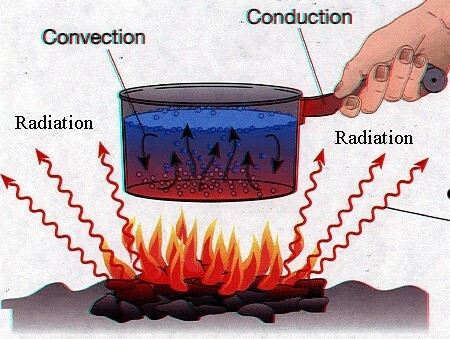 Conduction- transfer of heat from one molecule to another within a substance. Convection- the movement of warm air currents. (Warm air rises, cool air sinks). Radiation- the emission of heat through a hot object or source. What is the term used to refer to the direction that the suns rays hit Earth & how does it affect the amount of energy reaching the surface? The term is angle insolation. 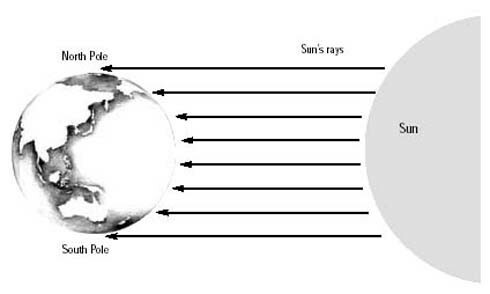 The amount of daylight hours affects the amount of time insolation is recieved, and the angle of the suns rays affects the intensity of the solar radiation received. 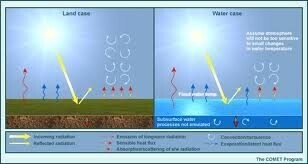 Together the intensity and duration of solar radiation affect the warming and cooling of Earths surface. What does energy transfer between the Earths surface & the atmosphere create? Uneven heating changes the balance of the Suns energy in Earths atmosphere. Warm air at the equator rises and moves toward the polar regions. Cool air there sinks and moves toward the equator. The constantly moving air creates wind and weather. How do land and water compare in their abilities to absorb and transfer heat? Which part of Earth receives more of the Sun's energy per unit area: the poles or the equator? Why? The equator, because it is receiving the direct rays of the suns energy. Morgan, Sally, and Adrian Morgan. Using Energy. New York: Facts on File, 1993. Print. Plant Life. Alexandria, VA: Time-Life, 1993. Print. Gabler, Robert E. Physical Geography. Belmont, CA: Brooks/Cole, Cengage Learning, 2009. Print.